Buckling up is the simplest way to save your child's life - and do not insist on the wearing of seatbelts is "a form of neglect", said trauma doctors and traffic officials recently. "Studies in the United States have shown that wearing seatbelts could have prevented 75 per cent of injuries in children under the age of four, and 50 per cent in children aged four to 12," said the head of the emergency and trauma unit at St Dominic's Hospital Dr Jeanne-Marie van der Westhuizen. "We are failing our children by not enforcing the law that is there, by not using common sense and by not teaching our children to buckle up." A chief traffic officer confirmed that it was compulsory for passengers and drivers to wear seatbelts in terms of regulation 213(4)of the National Road Traffic Regulation, under the National Road Traffic Act, 1996 (Act No 93 of 1996). Cognisance should also be taken of the prohibition by Regulation 213(5) of a person occupying a seat in a motor vehicle which is not fitted with a seatbelt, whilst those fitted with seatbelts are not occupied. AARTO makes provision for a 50% discount if the fine is paid within 32 days, therefore all of the above can be divided by two! AARTO is ONLY IN FORCE in the jurisdictions of the Johannesburg and Tshwane Metropolitan Police Departments. Fines in other Magisterial Districts can and probably will differ dramatically. There are 284 local authorities, 8 Metros and 9 Provincial authorities in South Africa and therefore the disparity between fines may be vast. In my opinion, the penalties scheduled under AARTO for seatbelt infringements are pathetically low, especially in light of the fact that they carry NO demerit points for the physical (not roadworthy) infringements. I don’t really care that the fine is applicable to each passenger not wearing a seatbelt since lives and injuries are not cheap. Someone on Facebook made an awesome suggestion with respect to parents who allow their kids to not wear seatbelts, stand in cars, etc. “Force parents to sign organ donor cards for their kids they allow to stand in cars.” I must admit that I am very tempted to write this suggestion into my submissions to the Department of Transport the next time I submit legislative comments – not just for children, but for everyone who doesn’t wear a seatbelt! At least that way we could put the wasted lives to good use! 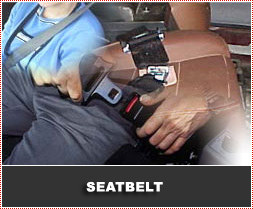 "The reason other countries have lower death rates on the road is that they have higher seatbelt wearing rates. "You must buckle up your children at every opportunity whether they are two or 22 years old," she said. The head of the department of trauma at Red Cross Children's Hospital in Cape Town, Professor Sebastian van As said that if an accident happens and a child is thrown out of the car, there is a 75 per cent chance that the child will die. "Trauma kills more people under the age of 18 than any disease and the children most severely injured are from motor vehicle accidents," he said. "The majority killed are pedestrians, but the second biggest number are those children thrown out of the car." Van As said: "Children that are loose in the car are usually thrown and they become like missiles. If a child is in the back seat and the car has a collision travelling at 80km/h when the car comes to a stop the child becomes a projectile that can even decapitate the people sitting in the front seat." He was equally vehement about the dangers of simply holding children on an adult's lap. "Often parents are under the impression that it is okay for the child to be on their lap or held in their arms, but this is useless in an accident because of the huge forces (of gravity) are involved."